Out-of-the-box, the developer portal enables your app developers to register, sign in, and manage the apps that will consume your APIs. The following sections describe how app developers interact with your portal. Developer registration and portal sign in are tracked using the _apiportal custom attribute in Edge. 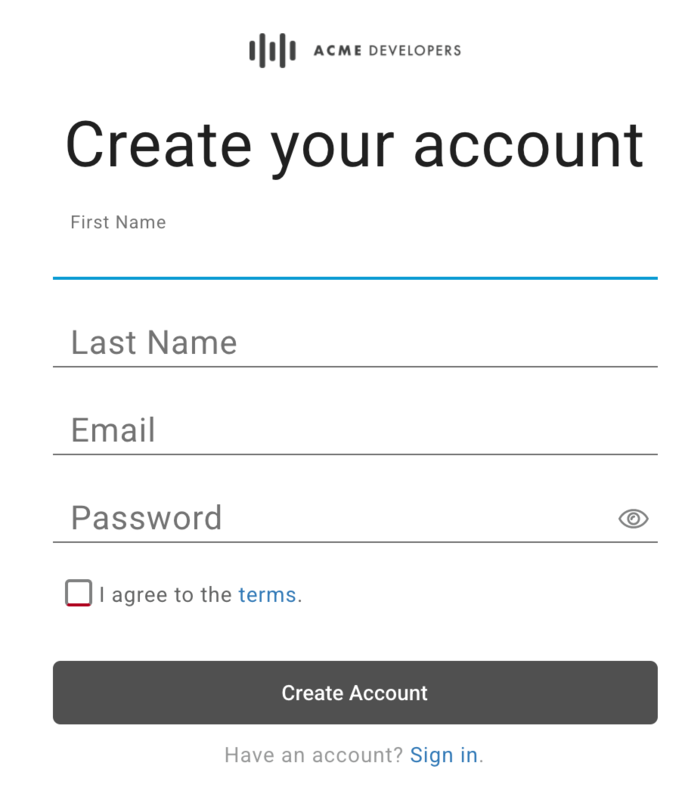 Before app developers can use your APIs, they must register an account. App developer information is created and stored on Edge. See Where API developer information is stored. App developer appears on the list of registered app developers. See Register app developers. Although it is possible to create accounts for app developers on their behalf using the Edge management UI, as described in Register app developers, this is not recommended to ensure that the user accounts on the developer portal and Edge stay in sync. The Create your account page displays. Note: You can custom fields to the account creation page, as described in Add custom registration fields to the account creation page. Complete all fields. All fields are required. Review and agree to the terms and conditions. Note: If a developer attempts to register an account with an email ID that has already been registered, a message displays indicating that the account already exists. If the system suspects your interactions to be robotic, complete the CAPTCHA form and click Verify. Your account is created and a confirmation email is sent. Note: To configure the SMTP server, see Configure an SMTP server. Click the link in the confirmation email to complete the registration process and sign in to the portal, as described below. After app developers have created an account on your portal, they sign in. After 24 hours of inactivity, an app developer will be signed out automatically and will need to sign in again. If you configured your portal to require manual approval, you need to manually approve the account before the app developer can sign in. For the Alpha release, the app developer is given no indication that their account must be manually approved before they can sign in. It is recommended that if you configure manual approval, you expedite the approval of new accounts. Enter the email address and password. Enter the email address for which you want to change the password. Click Send Reset Password Link. A reset password link is sent to the email account. Note: The new password cannot be the same as the old password. The password is reset and the user is signed in to the portal. Click APIs in the top navigation bar. Click an API card to view the API reference documentation. The API reference documentation is displayed. User can learn about and try the APIs. See Overview of API publishing. Select My Apps from the user drop-down. Click + New App to create a new app. Enter a name and description for the app in the New App dialog. Select one or more APIs in the APIs section. You must select at least one API in order to create an app. App developers can manage the API products in their apps. The API products are added to the app details page. For some API products, approval is not automatic. A status of Pending indicates an API product for which access has been requested but not yet granted. API products that are not published are not displayed currently; this issue will be fixed in a future release. Click the app in the list. In the APIs section, click the access toggle to enable or disable access to an API product from the app. If the app developer disables access to an API product that is Private or Internal only, the API product is removed from the app and must be re-added manually by the portal administrator, as described in Register apps and manage API keys. View the API keys in the API Keys section. Confirm that the status of the API key is Active. Click Show to view the secret. Position your cursor over the API key or secret and click to copy it to the clipboard. If either the developer or developer app has been deactivated/revoked, the API key will not be valid until the developer or developer app is re-activated/re-approved. For more information, see Activate and deactivate a developer and Approve or revoke an app. An app developer can rotate an app's API key periodically or in response to a potential leak or compromise. When an app developer rotates an API key, a new API key is created with the same API product entitlements as the original key. The original API key remains active while you transition it out of use. You must revoke the old API key to prevent its credentials from being accepted, as described in Revoke an API key for an app. In the API Keys section, click Add Key. Click Confirm in the dialog box to confirm the operation. Optionally, revoke the old API key, as described below. When an app developer rotates an API key, as described in the previous section, the API key remains active while you transition it out of use. You must revoke an API key to prevent its credentials from being accepted. Click the name of the app. On the App Details tab, click . Click Confirm to confirm the operation. The Status of the key is updated to Revoked. Edit the Name or Description fields on the App Details tab. The app is deleted and removed from the My Apps list.